To Margaret, friend. From Bernie Jordan. You are a Friend with a capital F – a Friend in the Quaker sense. 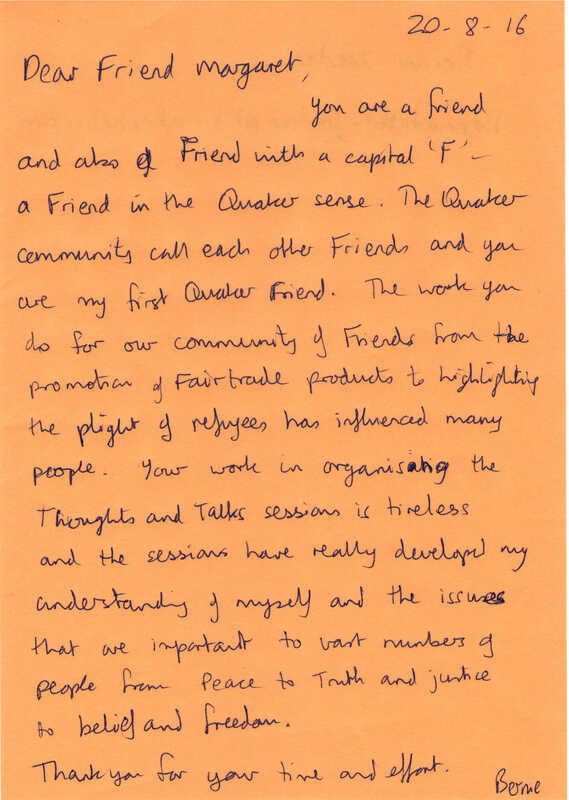 The Quaker community call each other Friends and you are my first Quaker Friend. The work you do for our community of Friends from the promotion of Fair Trade products to highlighting the plight of refugees has influenced many people. Your work in organising the Thoughts and Talks sessions is tireless and the sessions have really developed my understanding of myself and the issues that are important to vast numbers of people from Peace to Truth and justice to belief and freedom.